Everytime we get back on the blog and manage the time to write the latest adventures, it is hard to think what happened a week prior, but we will do our best. Our one and only night in Puerto Vallarta was quite the hoot. Wes, Michele, and The Rangers went out for a night on the Malecon, to do some dancing at the clubs and a little partying. We did PV up right and spent the whole night out on the strip partying. The next day we had to leave early to bike, with a big hill climb in between PV and our next destination, Rancho Sol y Mar. Just as we went to sleep, we had to wake up. Time to get on bikes and say good bye to our dear friends. Without even enough time to feel hungover, we jumped on the bike and started riding through the humid, temperate air Mexico offers. Was it worth it? Absolutely! Rancho Sol y Mar is 75 km south of PV with a 30 km hill climb in between. After partying all night, we were definitely feeling it. This day definitely rivaled the heinous cross wind of 2013 for the hardest day on tour. However, after 6 grueling hours of climbing and biking on a very rugged dirt road, we made it to Rancho Sol y Mar. Rancho is a sustainable, permaculture farm utilized as a campground for travelers and also as a teaching grounds for others interested in sustainable farming and living. Naturally this is right up our alley, and quickly sought out the Rancho after hearing about it. We got to spend 2 nights there for free. 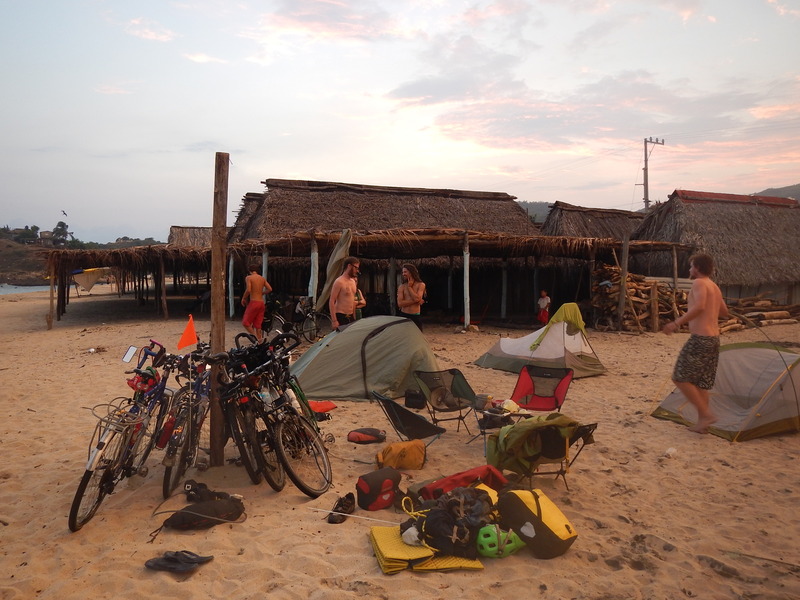 Rancho is part of the warmshowers community, which is an online homestay organization for bike tourists. It was awesome relaxing with the people of rancho, learning about their sustainable practices such as: cob ovens, cob builidings, solar heated water, and goat farming. Between learning about the farm and swimming in the beautiful playa only 300 meters away, our two days flew by quickly. It was at the Rancho that the Rangers and The Sustainably South crew parted ways for the first time. Ike and Hen wanted to stick around for a couple more days and learn more about the ranch, while we were anxious to get back on the bikes. So Bradie and Tommy hit the road after two nights at Sol y Mar, with plans to meet back up with Ike and Hen in a few days in the surf village of Boca De Pascuales. The first day from the dudes was pretty chill. We took a dirt road out from the village of Mayto where the ranch was located and rode that for about 60 km. It was here on this road that Bradie and Tommy got to do their first river fjording of the trip since the road was flooded by the river. That was rad! After riding on the dirt road for most the day, we finally made our way back to Highway 200. In search for a place to rest our heads, just as dusk was approaching, we found a tomatillo farm that had “campsite” written all over it. The ranch hand Oscar was more than willing to let us stay on the farm for the night and even gave us the go ahead to pick a bag of tomatillos. Naturally, Tommy got the idea to make his mom’s famous Chili Verde for dinner the next day with the fresh picked tomatillos. The next day was a pretty big riding day for us. We wanted to go to Barre Navidad that night, a mere 110 km away with big rolling hills leading us there the whole way. We were in the Mexican State of Jalisco, which is big rolling mountains along the pacific coast. Absolutely beautiful terrain, and breath taking scenery the whole day. After riding approximately 95 km for the day, we decided to make camp in the small beach village, La Manzanilla, which was a great call because right after La Manzanilla is a 10 km hill climb leading to Barre Navidad, which would have been a hard end to the day. 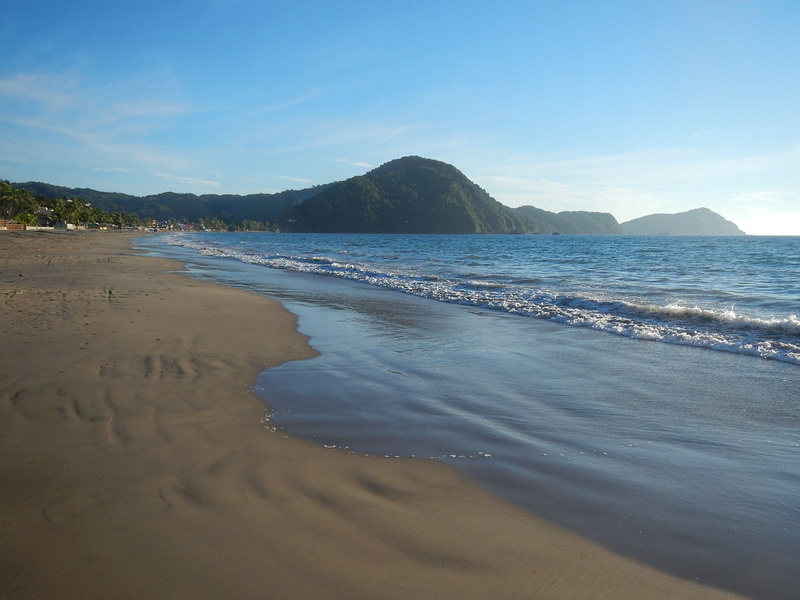 La Manzanilla was beautiful, a large bay, accompanied with warm water, perfect for swimming. 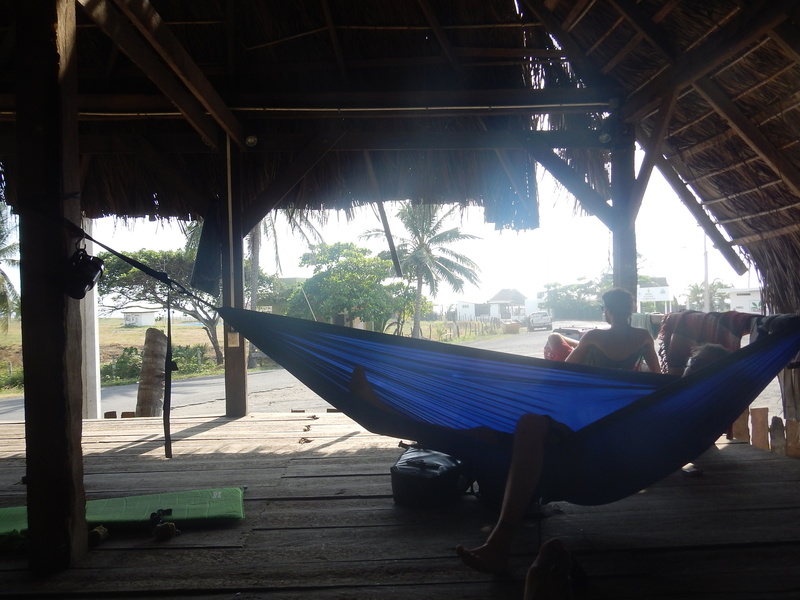 We stayed at a small campground on the beach surrounded by coconut trees and a cold shower. Everyone in La Manzanilla was great. As we cruised the town in the morning taking care of much needed errands, such as laundry and internet, the locals were so helpful. Bradie and Tommy were able to practice their spanish, holding conversations with the locals easily. Ike and Hen are definately more fluent in Spanish than us, so this break allowed us to get out of our comfort zone, and communicate with the locals…It was awesome! The ride after La Manzanilla was great! Lots more rolling hills, gorgeous scenery, and good weather. We had an interesting lunch this day as well. While eating, a local man our age who was a race cyclist training stopped to see what these gringo cyclists were all about. Eduardo was interested in our tour and generously offered us his energy bar and lady finger bananas! He lived in Santiago, our destination for the evening. In our half assed spanish, we figured out he was offering us a place to stay for the night, but unfortunately that didn’t work out. Again we ended up sleeping on the white, sandy beach in Santiago in front of a beachside restaurant. Thanks to Lee, the owner of a coffee shop in Santiago called, The Coffee Bean! 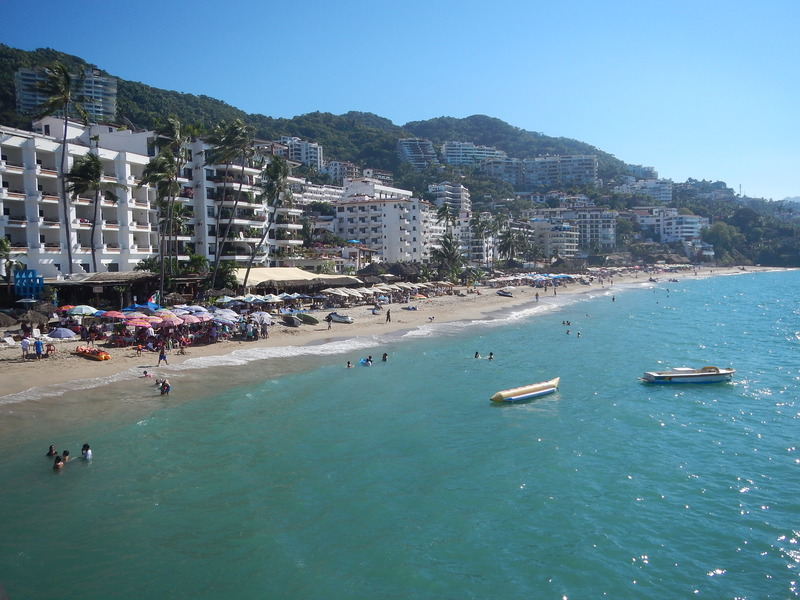 The next day, we had to stop in the biggest port city in Mexico that is Manzanillo. We have to get vaccinations for typhoid and yellow fever, since these are common in Centro America. We went to the Health Center looking for the shots. They said it would take an hour to get the vaccinations, but in the meantime we could get a tetanus shot if we wanted. Why not? When in Mexico! So no questions asked and completely free, we got some tetanus shots…Unfortunately they didn’t have the vaccines we needed, so we went on our way. Next stop, Boca de Pascuales, where we had planned to meet up with Ike and Hen the next day. The ride from Manzanillo was muy tranquillo. 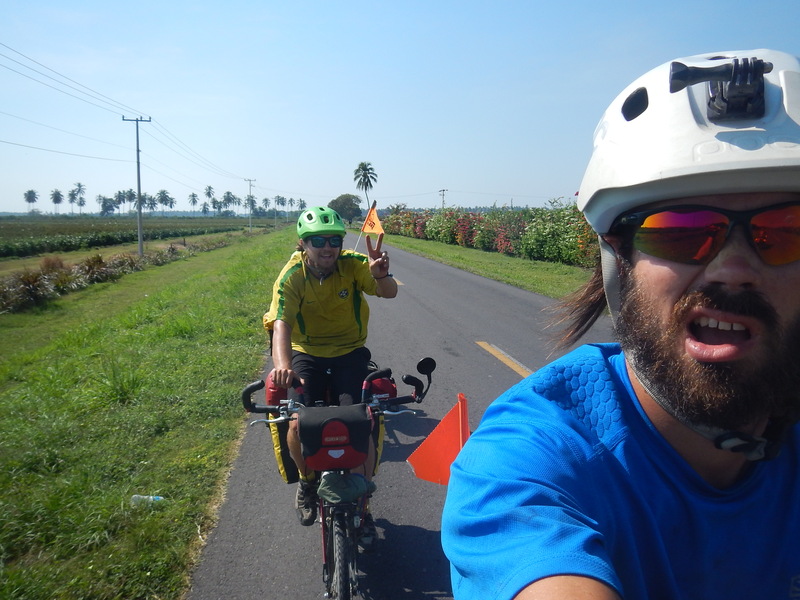 It started with a hot and sweaty hill climb out of the industrial port city then we dropped into the lush and green coastal plains, rich with banana plantations. Just as dusk approached, we arrive into Tecoman, which had 14 km bike path from the highway to the beach where Boca de Pascuales resides. Getting to Pascuales, we asked some local senoritas where we could camp, and they invited us to camp on the beach in front of the restaurant they worked at. Stoked for another beach side campsite, we set up our camp which included a personal night watchman that looked over the restaurant at night. To set the stage, Boca de Pascuales is a world renowned big wave surf spot that no one really knows about. After talking to a Sean, a gringo transplant, we saw and learned how big the waves were here. These were the perfect swells. I am talking huge barrels, 15 feet high. Perfect breaks and everyone is stoked because the swell of the winter is coming in and all the locals are stoked! Sean told us how his buddy Al owns a house with a 3 story ramada that people can camp on. Excited for this, we moved our camp, which is right at the beginning of town. Easy for the dudes to spot when they bike into town and quite the view of the beach too! When we arrived their were a bunch of local, surf bums chillin’ at the ramada. Tommy and Bradie quickly started chatting up the chicas, as this is the first time we have been able to chill with local girls our age. What better way to practice our spanish than sittin’ in the ramada, gettin’ fed cervesa by beautiful girls, and chattin’ them up! Just before dusk, the dudes rolled in, we saw them from the second floor and whistled them into their home for the night! The next day was a total rest day. We went swimming, chilled with the chicks some more, and one of the girls Gabbi took us to the beach by the Rio to boogie board. Even the boogie boarders are super extreme here. The waves are so massive, none of us have ever seen waves this big. Hen, Tommy, and Bradie went for a swim in the ocean and quickly got overwhelmed by the riptide. After struggling for a few minutes to get out of the water and avoiding what could have been a disaster, we sat on the beach and reflected on how powerful the ocean is and how easily it could take us all out. The next morning, we woke up, watched some people rip the big waves, as today was the day for the gnarly swells. The waves were so big, it was unfathomable to think people could rip them up. Even Allenito, our host Al’s, 11 year old son was rippin it. He is the future of surfing, and it was awesome to watch this future pro hit the big waves. But now it was off on the bikes again, the team of 4 reunited and ready to take on the powerful mountains of Michocan. The State of Michocan is known for its beautiful beaches, breath-taking cliff side oceanside, and its gnarly mountainous roads. We were stoked for it! We left Pascuales and headed south for Michocan. The first part of the day was chill getting to the new state, but right after the boarder crossing, we could tell it would be mountainous. It was getting late, so we made our home for the night in the town of La Placita. Switching it up from the salt life, we made camp next to the mouth of the river, enjoying a fresh water swim! That night it poured rain for about 2 hours, right after dinner. This was the first time the whole trip that it had rained on us! Getting up we were slow as we had to have our stuff dry out, but nonetheless, got on the road. The mountains were getting tough. Steep climbs, steep descents! Just how we like it. The beaches were so wild. Large breaking waves surrounded the coast the whole way. About 10 km from our desired destination of Marhuata, Tommy spotted some bike tourists stopped in a small town, so naturally we stopped to talk. Our new Aussie friends, Bren and Pepe, were on a bike tour from British Columbia to Cancun. We offered for them to ride with us, they accepted and the rest is history. Four bike tourists became six, and it was awesome! We made camp in Marhuata, a sick surf beach that was also the same beach that giant sea turtles lay come onto shore at night and lay eggs. 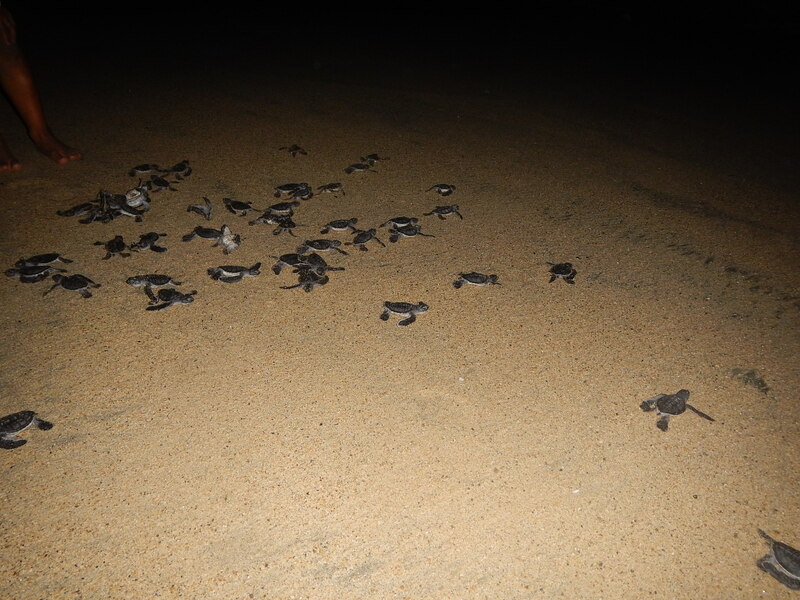 We got to see the turtles come onto shore and struggle to lay eggs, but in fear of stressing them out, we left them alone and went to bed! Tommy had the most excellent alarm clock the next morning. Hearing a shuffling noise, he looked outside his tent and saw a 3 foot turtle crawling past him, working back to the ocean. So amazing! What an experience and one he will never forget! Getting on the bikes early was essential because we had 100 km of huge hill climbs and descents to make it to Nexpa, where Bradie needs to be to take a bus to Oaxaca and meet They are on the way to Belize and offered to give Bradie a ride to Oaxaca, which is a life saver for him, helping him avoid a 3 day bus journey. But instead all of us got on the bus, named Down to Earth, and we were off, driving to Playa Azul, the last beach in the state of Michocan. It was so wild how the universe works. Bradie was dreading the bus ride and now he has sick ride in a sick bus, with some super chill people! We made a pasta feast for kings that night and passed out after a very long day! Well that brings us to the present more or less. 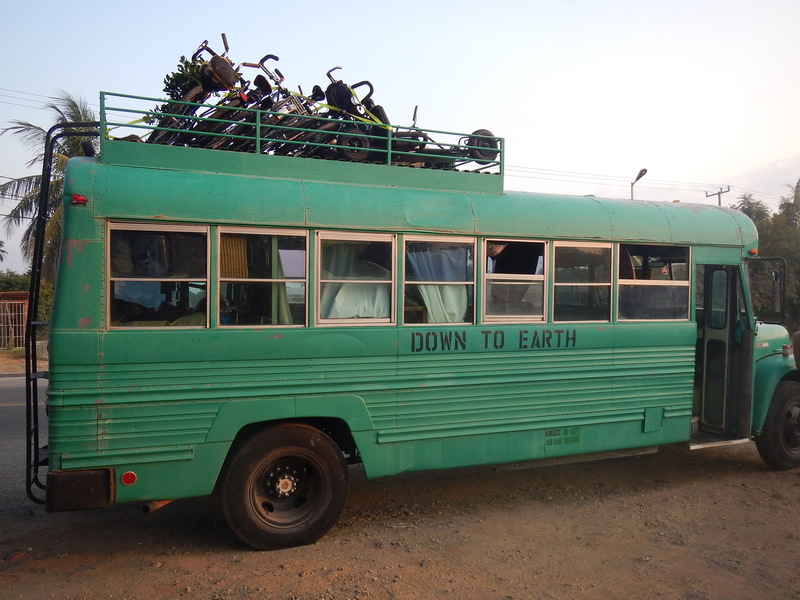 In the morning, the crew which was once 4 turned into 8 people, and we packed the bus for a ride south! 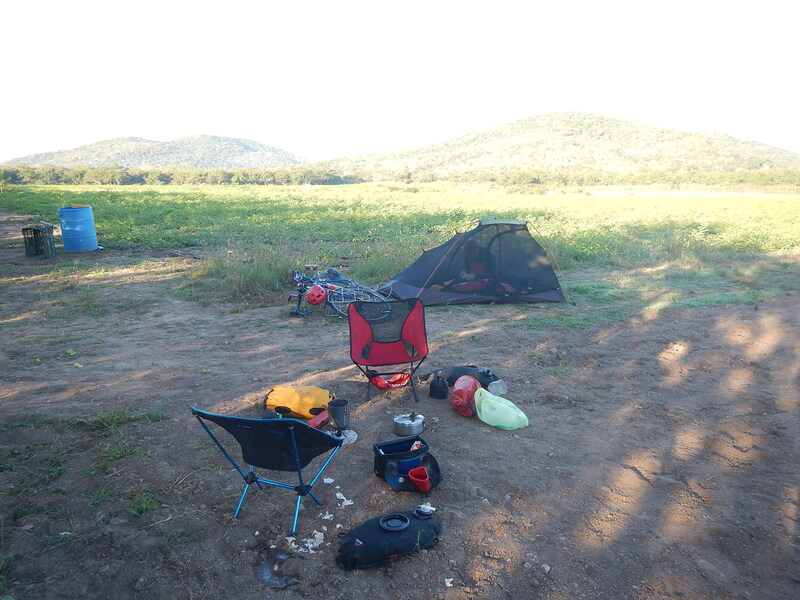 Bradie is riding with Laura and Ike to Oaxaca City, Bren and Pepe are riding the bus just south of Zihuatanejo, where Ike joined them, and Tommy and Hen, got dropped off in the seaside city of Zihua to chill out, shower, get a bed for a night, and dig the scene! It is crazy how each day brings something else, and how exciting it can be! Bradie is off to spend the holidays with Diana, hopefully meeting up with us in Puerto Escondido for New Years! The rest of the crew will keep pedaling south, perhaps with the Aussies, or maybe not but we don’t know. We are stoked on our new friends, new experiences, and new knowledge! ← Mainland Mexico and Beyond! Really glad to hear from you all. It had been awhile. It is so fantastic to read about your adventures, just keep on keeping on!